Turn your own salt and pepper shakers and then install this hardware. 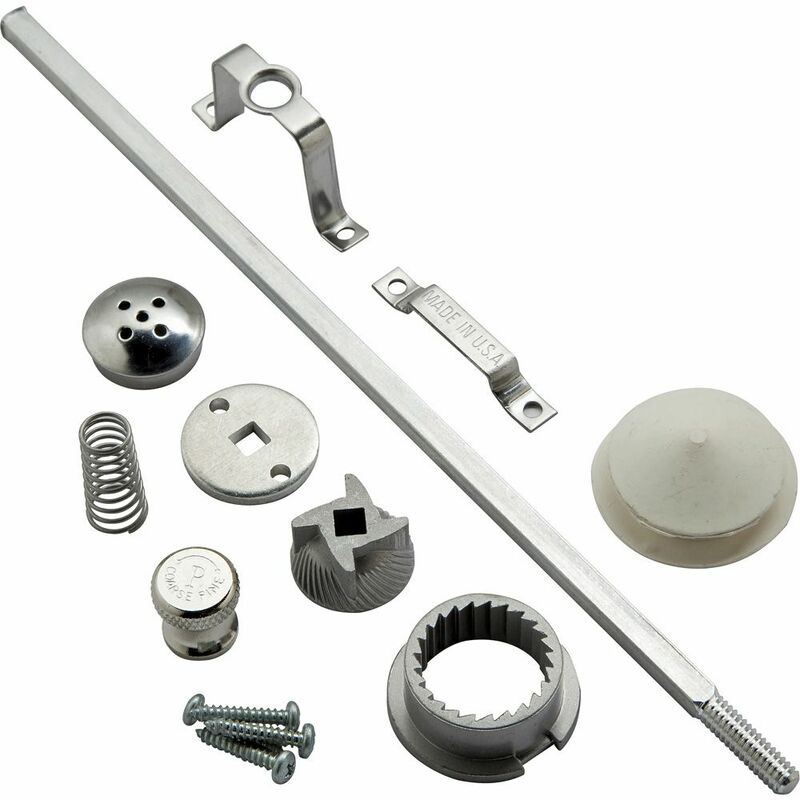 Set includes stainless steel grinding mechanism and shaker top plus a rubber stopper. Grinder may be adjusted for coarse or fine pepper. Great kit but you better have a way of boring a ten inch hollow. Made mine as a wedding gift out of purple heart. Came out great. 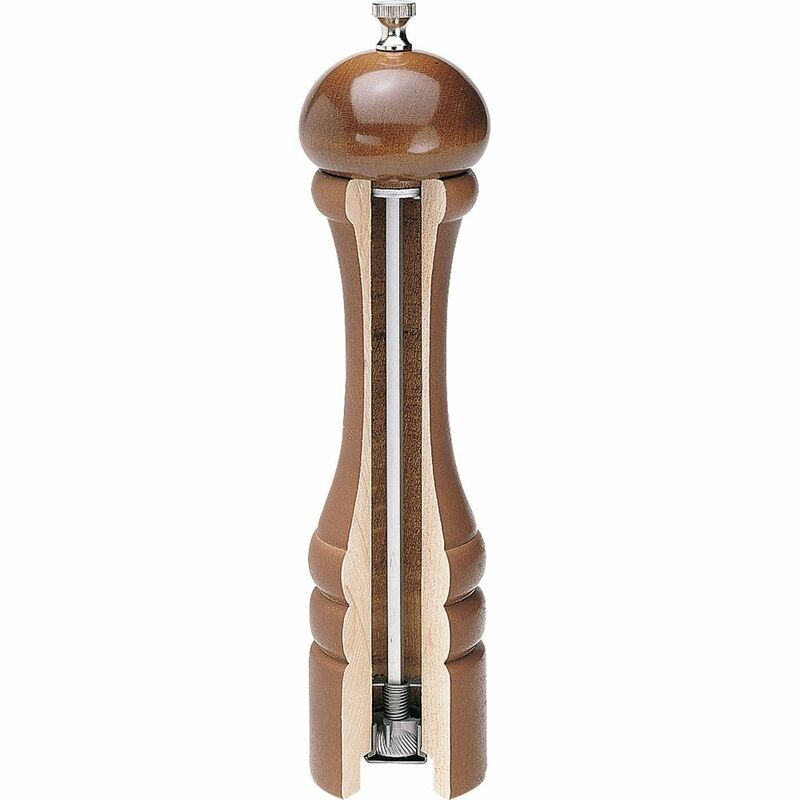 The pepper mill mechanism are very well made and are easy to install. There are very good directions included with the shipment. easily modifiable to fit custom shaped objects. ordered the long kit and cut down to desired length. material used was aluminum. I followed the advice of Richard W and found the mill very easy to complete. 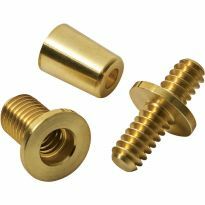 Be sure that you are careful that the length measurements are correct to insure that the rod and cap nut mate properly. Both the 8 and 10 inch mills are alike except for the shaft length. You will likely be buying of these to use as gifts or to sell. The grinder works as described. I bought three and all were of good quality. Take a look at the comments from Richard W for the best way to easily fit the mechanism into the wood. I used this Peppermill Hardware with a Bear carving, using a CNC Shark Pro Plus, It turned out great. Salt shaker is a Polar Bear Carving. I found the plans accurate and the pepper grinder mechanism of good quality. Not sure what additional information the other reviewers were looking for. It was a fun little project that was pretty easy. Very well built kit. Will last a lifetime. I’m a little concerned about the metal top for the salt shaker though. I hope it doesn’t corrode from the salt. The pepper grinder adjusts easily for different grinds. After using both the 8 and 10 inch sizes, I found them both efficient and easy to install. 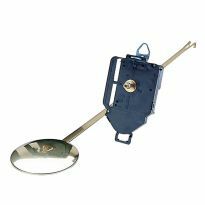 The salt top is a bit difficult to drill to size but other than that, they are easily drilled to proper sizes with standard bits. No offense to engineers, but why overthink something so simple as a pepper grinder. These mechanisms are simple, functional and robust. Have fun creating something different! I make bases that the grinder sets in keeping the grinds from leaking onto the table. I too had some problem with the lack of instructions, since I never turned a pepper Mill or Salt Shaker before. 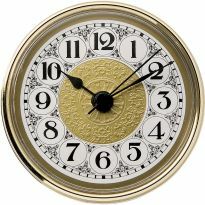 I am a retired Mechanical/Optical Engineer, and finally figured it out after studying the mechanism for a time. My hobby is woodworking. I drew up a design using my ACADLT97 computer software to figure out the proper dimensions for the Pepper Mill and Salt Shaker.I did not have a 1-1/16 diameter drill bit, so I made a tool using a 1/4-inch square x 1-inch long tool bit and broached two keyway slots 180&deg; apart and one-inch deep for the bridge bracket to slide into. Everything worked out fine. The bit required for the peppermill, the size of 1 1/16 is very diffucult to find. I took a 1 1/8 spade bit and ground it down to 1 1/16. It worked but it would have been nice to have it included in the 22-Pc Forstner bit set that I bought. The merchandise fit perfectly and it was a nice challenge and project. I am giving it to my daughter. The shakers were made out of red oak and maple and finished in lacquer. The peppermill goes together well and works fine. The top for the salt shaker is a bit too small for a 3/4 inch hole and falls out. It's difficult to make a smaller drilled hole bigger so the top fits snugly. I have to agree with the other reviews about lack of guidance on this particular kit-the line drawing of how to install the kit into your now turned pepper mill helps, but is not as helpful for a beginner as full turning instructions on turning a pepper mill. Other key notes, the 1 1/16&quot; drill bit required to bore out the main body of the mill[usually a Forstner Bit] is not a common size. You have to hunt for it, as it's not going to be in the larger bit kits. It would great to offer it along with a short extender for any 3/8&quot; shank bit as a additional kit for making pepper mills. Using a regular carbon steel bit like a Forstner bit or a spade drill bit takes a lot more time to drill out your mills or salt shakers since you must prevent burning either the wood blank or the drill bit itself. Especially if you're turning a tropical/exotic hardwood pepper mill.At any rate, you take your time with a plain steel bit and get the job done. I recommend getting a good scroll chuck and a cone tailstock center set if you don't already have one to help make turning a pepper mill easier. You can always turn your own wood cone pieces for supporting the bored end of your mills. While the finished product in very good, the instruction sheet is very, very vague. No clues about the piece sizes that are needed. Who ever wrote the instructions should be ashamed of what they produced. I agree with some of the previous submissions. I can't figure out how this goes together. For use in making a gift. I chose this as a replacement part for a pepper mill that I currently have. This is a good kit. Mill grinds pepper very well and is easy to install. This appears to be the best peppermill hardware available. My granddaughter wants to make a set as a gift. I made several of these for gifts last year, and they were well received. I need to make a couple more. pepper mill has two angle flat pieces with holes cut in them on each end. the graphics do not show where the smaller of the two fits. could I see a picture of putting these pieces together? I am building my first pepper mill. What size blank do I need for the 10"? How wide though? will a 2" X 2" X 12" work? will a 2" X 2" X 12" blank work for the 10" pepper mill? BEST ANSWER: Not really. The first cut with a forstner bit is 1&5/8 inches, if you find dead center to start with that leaves you only 3/8 inch for the sides or 3/16 for the wall which is pretty thin, I don't think you will be satisfied with it. You really need 2&1/2 inch blocks to start the project. The kit recommends a 2-1/2 x 2-1/2 inch minimum size as you will need to drill a 1-5/8 inch hole in the bottom of the peppermill. The block should be 2-1/2-in. To 3-in diameter and 1-1/2 to 2-in longer than the mechanism. WHAT MATERIAL ARE THE TWO GRINDING ELEMENTS MADE FROM ? Metal ,plastic or ceramic ? 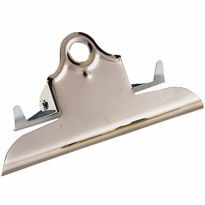 BEST ANSWER: the two grinding elements were made of stainless steel. The grinding mechanism is metal. what are the dimensions of the shaft? I am using it for a repair I am hoping it to be 10" by 3/16" square and do you know what the threads are on the end? Do you need jam chucks? and if yes are they included? BEST ANSWER: Jam chicks are not included. A jam chuck is a good idea. I have one I made that fits the parts and just use it over and over. It fits the top and then the bottom with the tail stock in the bottom to keep it secure. 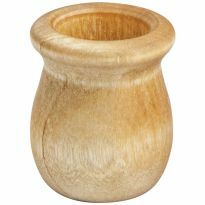 I don't do wood turning and therefore don't know what a jam chuck is. I have a friend who is a wood turner so I just let him do my turning. Jam chucks and all. Do these grinding mechanisms also grind salt (i.e. himalayan pink coarse salt)? BEST ANSWER: The salt mill has ceramic grinders that salt will not corrode. You cannot use salt in the pepper mill because the carbon steel grinder will become corroded.